“I really didn’t like to play piano,” said Seraphini Wang, a sophomore at the California School of the Arts in the Instrumental Music Conservatory, who now spends on average two hours a day at school playing piano. Wang said her mom made her play it at the age of 4-years-old. To her, it was more of a chore than a hobby. For an hour every day, she had to practice. Wang often found herself in the middle of fights with her mom because of it. Now, however, Wang can be seen practicing in the music rooms for extra hours after school because she wants to. This sudden change of dislike to passion was due to a new freedom. Wang said that it all changed when she went against her teacher’s wishes and decided to buy random books with songs from musicals and movie soundtracks. “I did these on the side for fun,” she said. No longer was she forced to play the songs that were given to her, she was free to explore different music that she wanted to play. With this, there was this sense of ease and as Wang said it, “a sense of flow through the piece.” Over the years, she has learned to appreciate this gift of music that could be expressed freely through the songs she chooses. Since then, Wang has performed many times such as being part of the pit at the Pippin production hosted by CSArts. However, her proudest, being at Carnegie Hall. It was a competition in which Wang had to submit a video of her performing. Competing against other contestants around the United States, she was accepted as one of the winners to be invited to perform at Carnegie Hall. “At first it was intimidating because it’s this whole big place, but then once you got there, you realize that it was just like any recital, a performance opportunity,” said Wang. However, this didn’t mean Wang was not nervous at all. She remembered getting stiff, unable to move her fingers, which was not the ideal state for a pianist. “It was just a lot of breathing and keeping my heart rate down, because once it [my heart rate] goes up, I speed through the music. I try to not notice all the people looking at me,” Wang said. 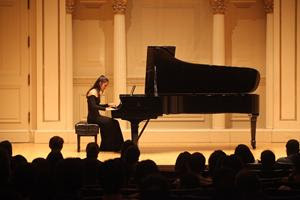 Although the piano is more of a soloist instrument, Wang wouldn’t have been able to get over her nervousness about performing without the support of her conservatory classmates. During their Master Classes, students are required to perform in front of each other, and according to Wang, it’s very helpful. Not only does it help her nervousness, but the students have to critique each other, and in that way, it also improves their playing skill. “Even if we don’t play the same instruments, we are all there to learn from one another,” Wang said. She especially enjoys how inspiring her peers are during practice sessions, when they would all listen through headphones and play on their own separate keyboard, all at the same time.